This weekend the guys are finishing the backyard deck and then we start work on the patio. We plan to install a beautiful pergola for outdoor dining over a pea gravel patio. Hubby and I have looked at both metal and wooden pergolas. I love the organic appeal of real wood, but metal seems to be less expensive. 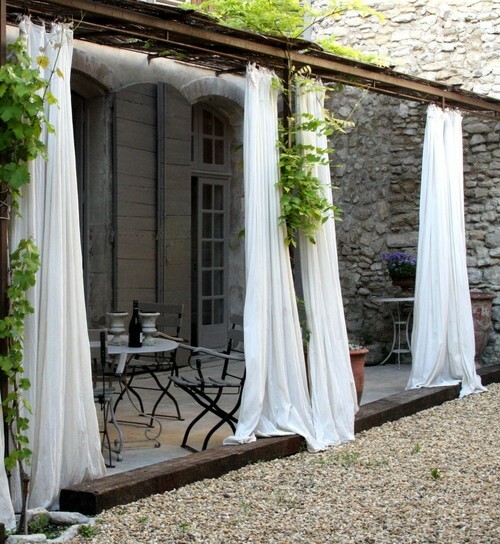 This pretty pergola features romantic curtains – but how do you keep them clean? Our pergola will be situated off the garden shed. While I like the look of white, it means more work painting it when needed. This one is stained a pretty blue to match the house. I definitely want some type of flowering plant vine to grow up the pergola. Anyone have suggestions for a fast-growing hardy vine works in Zone 5? 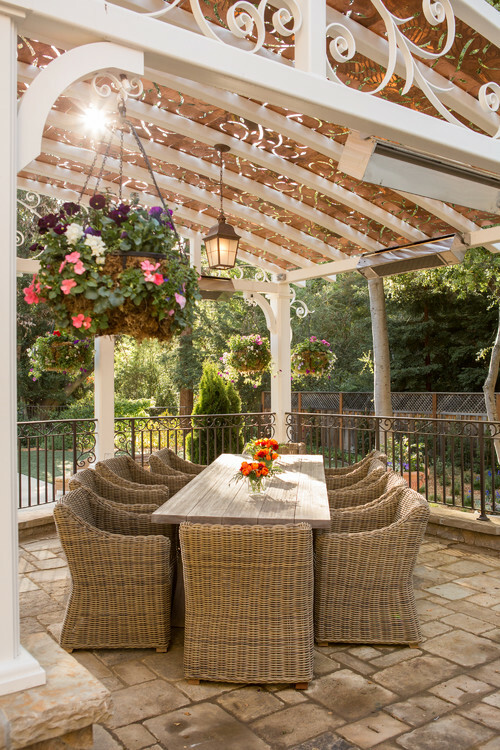 Here’s another simple wooden pergola with enough space for hanging flower baskets. I like the addition of a ceiling fan – great idea! 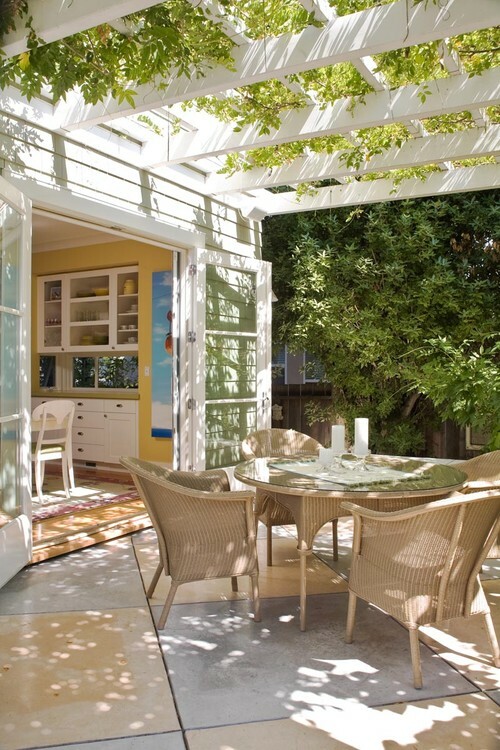 We initially considered red bricks for the patio floor, similar to this with moss growing up between the cracks. For now though, we’re starting with less expensive pea gravel and might upgrade to brick later on down the road. 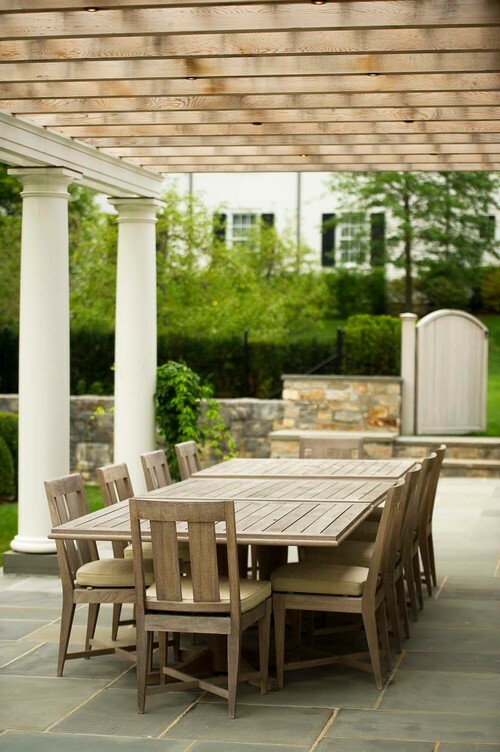 This is a beautiful patio for outdoor dining, but a little too refined for our outdoor living space. I want to walk through that gate and explore the rest of the garden! I never thought to add curlicues to a pergola, but this look would certainly work well with our Victorian style exterior. 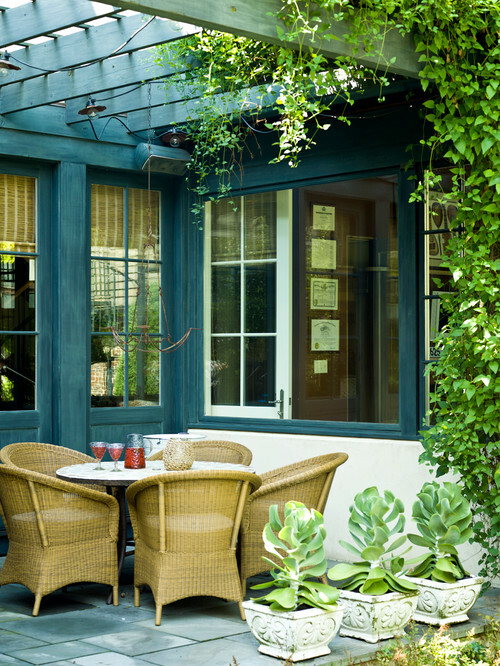 Honestly, this sweet little outdoor dining space is right up my alley. It’s not ornate and has earthy appeal with all the plants! 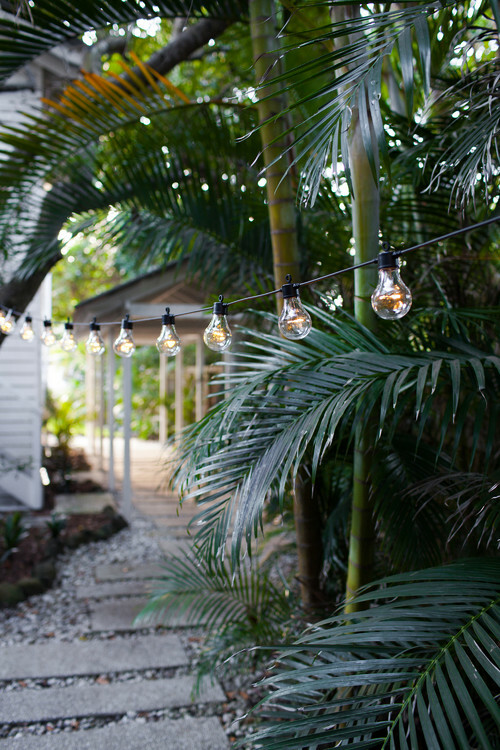 One thing I know for absolute certain – I want these Edison style string lights!! 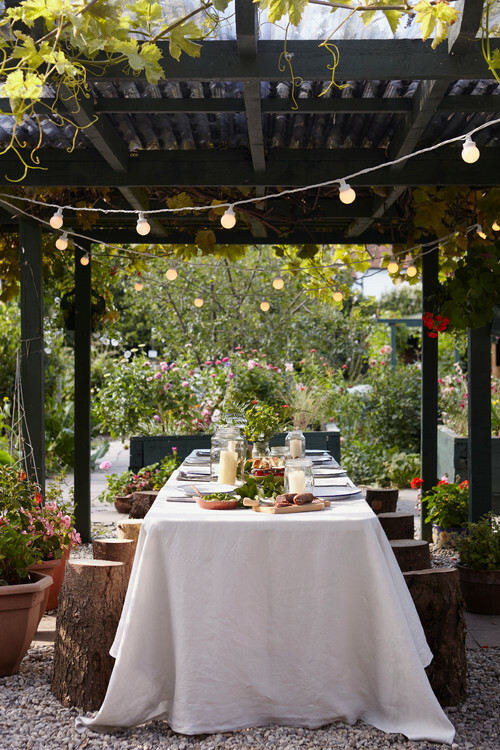 Whether we hang them from the pergola or stretch them above the deck, they’ll provide a bit more outdoor lighting for entertaining at night. Once the backyard is complete (in a few weeks, I hope), we’re having a themed party for the family. It’s so nice to finally have a backyard that’s both useful and beautiful! I can’t wait to share the full reveal with you. 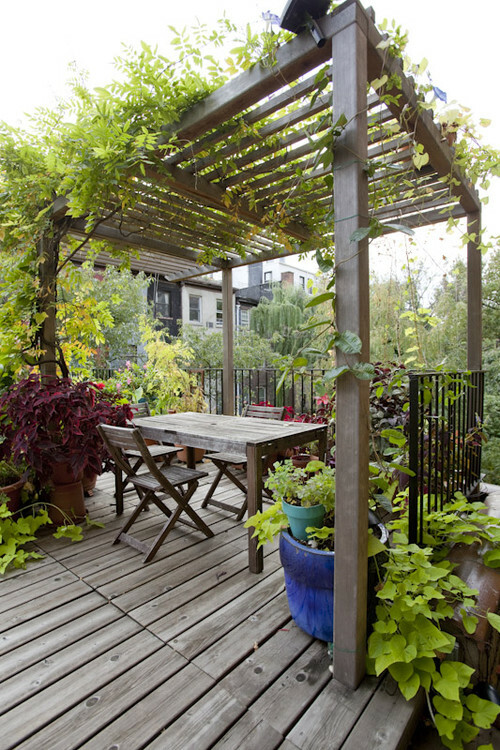 And any tips you have about pergolas and flowering vines for Garden Zone 5 – I’m all ears! Good luck! I love Door County, have been there several times. My daughter has her art displayed in Woodwalk Gallery which is in Egg Harbor. It’s a charming town, wonderful shops and areas to explore. I have close friends who built a pergola over a pea gravel deck. It was very pretty for a minute. They quickly removed the gravel and paved the area with brick pavers. The gravel didn’t stay clean looking – attracting leaves, small sticks and debris from surrounding trees. They also didn’t like the feel of chair legs in the gravel when dining there. It’s all a matter of preference, and I’m not trying to discourage you from pea gravel, but thought I’d pass on an experience of which I was aware. So looking forward to seeing what you do. I know it will be amazing. I love them all but something spoke to me with the more simple look. Like us we get harsh winters and that has to be considered with upkeep for our areas. 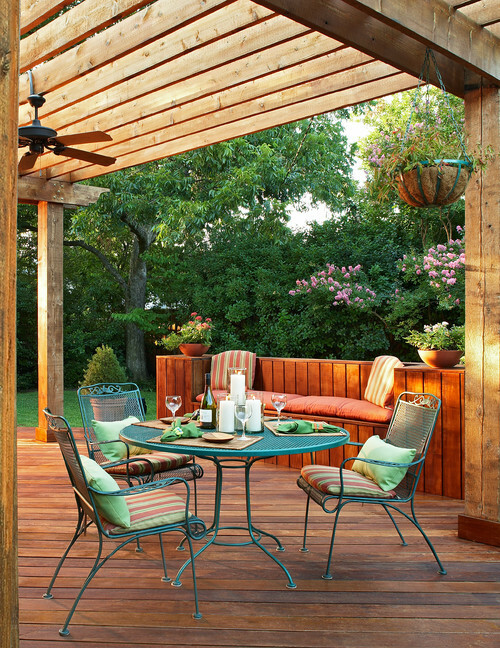 Can’t wait to see your deck and pergola. I know it will be FABULOUS!!! Does wisteria grow well in your region? 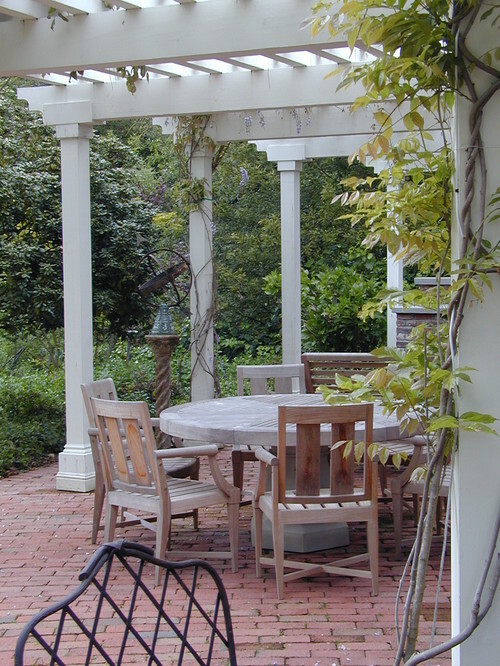 We have two pergolas (matching) in white, and the wisteria in purple looks absolutely stunning in the spring. And it occasionally will flower one other time in the summer. It’s a fast grower, but be sure to train it to go where you want as the stem grows into the size of a tree trunk when mature. It also takes annual (and even more) pruning to keep it under control. But it’s worth the maintenance. Although I love using old brick, when it’s in total shade the moss can get slippery because it won’t only grow between the bricks — it will cover their surfaces as well. I agree with the suggestion of hyacinth bean as a fast-growing vine. Beautiful, too. There is a Carolina Jasmine that grows pretty fast and smells wonderful. I like the last one the best, you could always put up some ornamental iron in outside corners to dress it up a little. Whatever you decide will be perfect and i am anxious to see the finish. I like all of your pergola ideas, especially I love jasmine as it smells will take you to the other world. In fact, I like the second one since it’s simple but look stylish. Love the ideas of Jasmine and Wysteria. Jasmine may not winter in your area tho… Have you considered Grapes!? My are doing well on an arbor my husband built (We were inspired by my aunt in Cali who had a pergola over her patio covered in grapes!) When I discovered we could grow them(I also live in a zone 5), we went for it! They are doing very well. And you get juice in the end! I LOVE your #3! I pinned that one ages ago because I love white trim and all things white really! I am in NW Indiana-also zone 5. Silver lace vine is a fast full vine, sweet autumn clematis, although slower to fill in gives you flowers in late summer when other plants are petering out. I have both and wouldn’t hesitate to use them on a pergola. Also love hyacinth vine, however it is an annual, the others above are perennials in zone5. I really do like vines…really…but, I do not want them overhead, my imagination gets the best of me, I don’t know what is crawling above. And I don’t want twigs dropping in my food and scaring me.